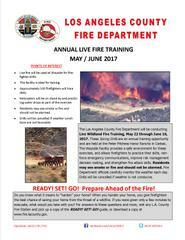 Our annual Wildland Fire Drills are underway and will continue through June 16. These drills will involve live fire and involve both ground and air resources. Drills take place at Wayside Honor Rancho in Castaic. Conditions are monitored daily to ensure safety, and drills can be cancelled on any given day if weather conditions are not conducive. See flyer for more details. Thank you.